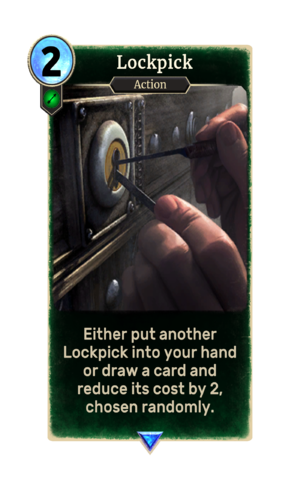 Either put another Lockpick into your hand or draw a card and reduce its cost by 2, chosen randomly. Lockpick is a rare Agility action card. It is part of the Heroes of Skyrim expansion. This card's ability applies the Purloined Loot card effect to the drawn card.